Will the USA cease to exist as we know it if the minimum wage is raised to $15? Surprise, surprise! Jim Arnott is the Sheriff of Greene County, Missouri. 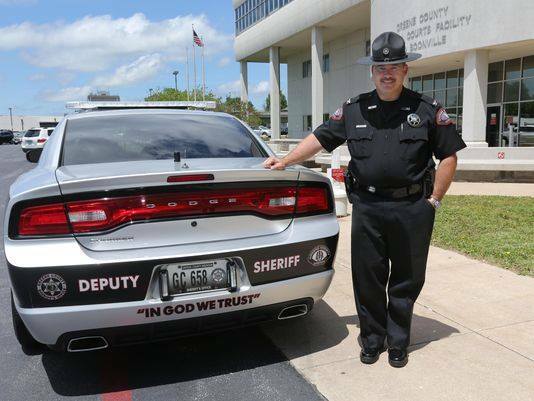 He recently had “IN GOD WE TRUST” lettering added to about 100 patrol cars because, as he said, “I like it“. I became aware of this through the Facebook page “Sheriff Deputies“, when they posted the picture to the news feed. Disappointingly, it’s getting a lot of approval from others. Few seem to understand, or even care, why it is highly inappropriate for this kind of religious proselytizing to exist in a government agency. Our own community has recently had issues with law enforcement lending it’s imprimatur to a purely religious ceremony, and many are defending the decision of government officials to attend. Here, they’ve dismissed the connection with the keynote speaker, Tony Perkins of the Family Research Council, a designated hate group, as inconsequential. The Sheriff told the Visalia Times Delta that he didn’t “get any detailed information about Perkins and his reported agenda until after he and his command staff left”. At least the Sheriff here is claiming ignorance of Perkins and his agenda, but the Missouri Sheriff is more direct in his statements. Sheriff Arnott has unilaterally decided that his religious beliefs can be displayed on government property as he sees fit. Since most people in his area are Christians, few see any problem with the idea. They seem to view the idea of the long-established legal concept of separation of church and state to mean government cannot intrude on religion, but religion is free to intrude and impose on government. Many city councils, county supervisors chambers, and other government structures have “IN GOD WE TRUST” prominently displayed, and it’s pretty much impossible to find elected officials, or even bureaucrats, who are willing to challenge the placement of clearly religious wording in government facilities. The Supreme Court didn’t help matters by ruling in favor of those who want religion wrapped around their government. I find it disappointing that so many are content to allow government to grant a seal of approval to religious dogma, in clear violation of the idea that it should be completely neutral when it comes to such matters. They’re quite happy with the mixing of church and state, as long as it’s their church. I wonder how complacent they would be if it said “ALLAHU AKBAR”? Or “IN VISHNU WE TRUST”? Changing the name of the god should make it clear why any of them are inappropriate. If the Sheriff and his deputies want such sentiments on the cars they drive, let them put them on their own vehicles. Patrol cars are not the place to, as we LGBT advocates have been accused of doing every time we talk about rights, “shove it down our throats” in public.